If you’ve been paying attention to mainstream media recently, then you’ve probably been left thinking that regional New Zealand has been thrust into a deep recession. And although there is some truth to this story, particularly for dairying regions, my recent travels have shown me that there are selected parts of the country where economic and job market conditions are actually improving. At the risk of jinxing things, key areas with reasons to be looking forward to the year ahead include: Queenstown, Nelson/Tasman/Marlborough, Napier/Hastings, Rotorua, Tauranga, and Thames-Coromandel. These areas with reasons for optimism all have relatively low exposures to dairying and are selling goods and services whose returns have been boosted by the recent sharp falls in the New Zealand dollar. This article takes a look at these regions’ economic outlooks, and contrasts them with the worst performing local economies over recent quarters. This contrast is important because, in a roundabout way, dairy’s woes in the worst performing areas are ironically one factor supporting the improving economic conditions for the selected group above. The doomsday story prevailing for regional New Zealand at present is based on the idea that a second consecutive year of low dairy payouts will see spending and investing in our regions dry up. Put simply, farmers won’t spend on anything but the bare necessities as they watch their overdrafts grow, while businesses and households that indirectly rely on dairy spending will also be feeling less willing to part with their pennies. 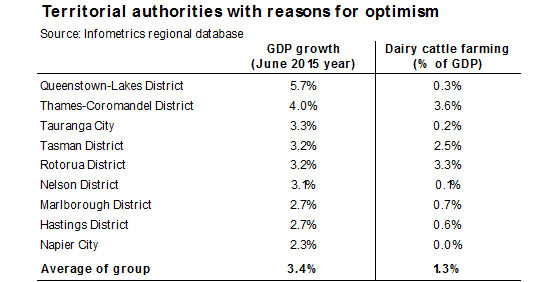 Insights from Infometrics June quarter regional economic monitor support the idea of weakening economic activity in areas with high dairy exposures. 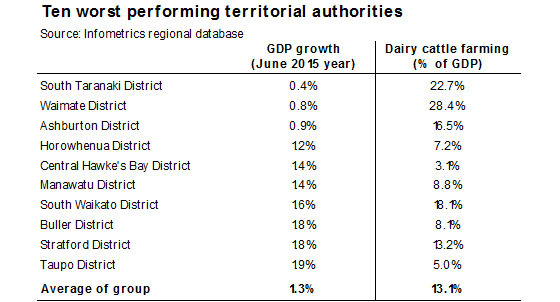 The following table shows that the ten worst performing territorial authorities from an annual GDP growth perspective in the June quarter all had high dairy exposures. Over the year to June 2015, this group of territorial authorities experienced average growth in economic activity of just 1.3%, compared to growth in the New Zealand economy of 3.0% over the same period. These territorial authorities with weaker economic growth generate an average of 13% of their GDP from dairy cattle farming (i.e. excluding agricultural support services and the processing side of the dairy sector), compared with the 2.4% of GDP which dairy cattle farming accounts for in the overall New Zealand economy. 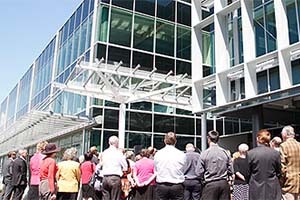 Looking deeper at these numbers, as well as other spending and investment indicators from the June quarter monitor, suggests that South Taranaki, Waimate, and Ashburton are almost certainly already in recession, with most of the other seven territorial authorities on the list teetering on the edge of recession. Furthermore, dairying isn’t the only worry for some of the worst performing parts of the country at present, with weaker forestry prices and lower harvesting activity a real worry for Taupo and South Waikato. Plunging mining and exploration activity are factors further holding down Buller’s and South Taranaki’s economies. It also wouldn’t take much more of an economic deterioration for other dairying strongholds in parts of Waikato, Manawatu-Wanganui, Taranaki, Southland, West Coast, Otago, and Northland to join the areas singled out in the table and slip into recession. Whether the recent recovery to dairy prices at GlobalDairyTrade auctions is enough to ward off a sharper spending slowdown in dairying regions remains to be seen, and we will monitor spending and investment indicators in these areas closely over the coming months. Having dealt with the bad, let’s now turn back to the order of the day and put the spotlight on those places where economic prospects are improving. As suggested earlier, lower dairy prices are, in a roundabout way, a good thing for areas such as Queenstown, Nelson/Tasman/Marlborough, Napier/Hastings, Rotorua, Tauranga, and Thames-Coromandel. Higher exposures to the exporting of goods and services that are still maintaining healthy returns in world prices. The following table from Infometrics June quarter regional economic monitor gives an indication of how this selected group of territorial authorities performed over the year to June. Most of this group are recording economic growth well above the national average, while growth in other places such as Hastings and Napier is climbing and showing signs of pushing above the national average over the next couple of quarters. Marlborough’s 2.7%pa growth over the past year is solid and backs up 4.9%pa growth the previous year. The table shows that economic growth in this group of territorial authorities averaged 3.4% over the year to June, well above the national average of 3.0%pa. The fact that these areas all have low dairy exposures, means that they are not faced with the sharp reduction in farm incomes and spending that is occurring in the ten worst performing places listed earlier. The 28% decline in the value of the New Zealand dollar since its peak in July last year is further fuelling optimism because businesses in these territorial authorities sell goods and services that are still commanding favourable prices in world price terms. Queenstown, at the top of the list, may not be selling physical goods, but tourism-orientated businesses in Queenstown’s service sector are receiving a particularly large boost from the weaker New Zealand dollar. Just over a year ago, a visitor with a US$100 per day budget could spend NZ$113 per day on activities, accommodation, and hospitality, but now following the New Zealand dollar’s decline that same tourist can spend NZ$157 with same US dollar budget. With tourism accounting for over 40% of Queenstown’s GDP and given that 70% of total visitor spending in Queenstown is by international visitors, it is no surprise that this purchasing power boost is showing through in economic growth in the resort. Tourism is also a key economic growth stimulant in Thames-Coromandel, Rotorua, and the upper South Island, and is a factor that will provide some offset for Taupo from struggles in the forestry and dairy sectors. We anticipate that tourism will continue to experience strong growth over the summer season, as visitor numbers to New Zealand soar as a result of favourable pricing and increasing numbers of direct long-haul air connections. And it’s not just tourism that is boosting the outlook for the areas I have singled out. From the table below it is also clear to see that anyone selling meat and wool, fruit and wine, or seafood is doing quite well, in stark contrast to dairy farmers. Sales of these types of products are important sources of revenue in Thames-Coromandel, Tasman, Marlborough, and Hastings, while Tauranga, Nelson, and Napier benefit indirectly from businesses in these sectors increasing their demand for goods and services. We expect favourable prices for a range of meat, horticultural, and seafood commodities to persist into 2016. Better returns for meat, horticulture, and seafood exports, as well as the bullish outlook for tourism, will help ensure that business and households in these areas have the confidence to spend and invest. The prospect of lower interest rates over the coming months will further support spending and investment intentions. Already we are seeing strong levels of indicators such as building consents and vehicles sales in many of these areas I have singled out to watch, and expectations are rising of further growth to come. So before you write-off regional New Zealand as being a total basket case because of dairy’s malaise, be careful to scratch beneath the service to reveal the silver lining for many places who are not so exposed to dairying. I have taken a stab by singling out a short-list of Queenstown, Nelson/Tasman/Marlborough, Napier/Hastings, Rotorua, Tauranga, and Thames-Coromandel as areas to watch. But who knows, there may be other areas with similar attributes that also shine over the coming quarters. Benje Patterson is a Senior Economist at Infometrics. You can contact him here » This article originally appeared in Infometrics’ newsletter and has been republished here with permission. YoY GDP growth looks at whats happened over last 12 months. But you're not looking at the whole picture, or even a significant section of a picture. Whats the ave GDP per capita in taranaki versus Rotorua for example? Starting at a low base makes yoy gains easy... starting from a very high base makes them harder..
2.3% enough to earn a place on your best regions list, but 1.9% gets on the worse region list. Everyone says how well Auckland is doing, but it is only kept buoyant by homeowners getting "rich" buying and selling houses to each other at a greater and greater price. Productivity is stagnant in Auckland and the wealth created in housing cannot last. At least in the regions the wealth that is there is due to real production.